"Living with intention" has been getting a lot of buzz lately, especially going into the holidays. I think it's a reaction to our culture of rushing around all the time, more is more, go go go. It is stressful, and it tends to wreak havoc on a family, not to mention on me as an individual. So what does that look like, though, to be intentional about your life? Everything on your schedule is a choice you've made, to some extent, right? So how do you go about modifying those choices to allow room for peace, and for the things that are most important to you? 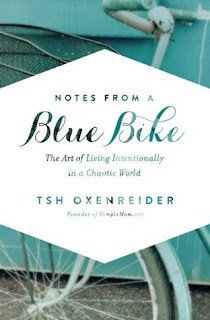 Tsh Oxenreider has a few ideas. 3.5 stars: Gave me a lot to think about. Having lived overseas and travelled extensively, Tsh offers insight into how an American family can slow down and live more simply. She makes the point that our society here in America is productivity based, rather than relationship based. So we tend to place much higher value on "getting things done" than on getting to know people or caring for them. We go at race pace until we're exhausted, without stepping back to figure out what is really most important to us as individuals or families. We use up resources--our own and the world's--at an alarming rate, with hardly a look around to see how everyone else is faring. I went into this one thinking I would agree on nearly every point. While there was a lot I took away from it, I found myself pushing back on some things, which surprised me. First let's talk about some of our points of agreement. Her discussion on choosing family entertainment in a mindful was spot on for me. I am anti-TV. It's not that I don't enjoy watching it either, it's that I enjoy it a bit too much. I can sit down to an episode of some home makeover show and 3 or 6 episodes later look around, wondering where the time has gone. We don't have a TV in our home at all. Yes, we're some of those people. The kids get 20 minutes of screen time every day, once they've finished their chores and music practicing. They can watch some shows from PBS kids, or play games on my Kindle. However, since we've moved, there have been many days where they don't get any screen time, because we've been too busy doing other things. I am totally okay with that, and they haven't complained about missing it, so there you go. Her take on travelling with kids was great. I would love to do more of that. We have really enjoyed our trips, though they haven't been abroad, and seem to create the fondest memories when we're all together, away from our normal routines. I also really like the idea of spending money on experiences rather than things. As much as civil unrest and long plane rides worry me, I think it would be awesome to experience more of the world, together. I think she's right when she says you just have to go. Don't wait for the perfect time, because there's no such thing. Have faith in your ability to handle whatever may come up, plan the best you can, and jump in. I want to do this! I also agree with her point that American culture centers around productivity, rather than relationships. I recognize this in myself. I feel much better about my day and how I've spent my time when I've gotten a lot done--tasks that could be checked off a list, were I to write one down. However, this one area that I found myself thinking, "Hold up." What's so bad about productivity? I believe in hard work, I believe in setting goals and working towards them. I also don't think those things necessarily shut out building relationships with people. I'm trying to teach my kids to value hard work and showing them how good it can feel to accomplish a hard task. How do I do that? Well, by example--I hope. Words too, but their dad and I make it a point to include them in any big family task, whether that's taking down a garden shed, or canning fruit. They're part of the family, so they're expected to help. At the same time, there's a lot of relationship building time as you do those tasks together. So I guess that part was a bit muddy for me. The idea I got was that when she lived in Turkey, spending a whole afternoon taking tea at a friend's home was considered a valuable way to spend time. I'm not saying it wasn't. I just don't think that's the only way to build relationships. You can build friendships one book club night a month, or in 1 hour increments, chatting away on the sidelines while your child participates in team sports. Phone calls, texts, emails, and written cards build relationships also, and can even be part of the "getting things done" for the day checklist. Maybe what she was trying to say is that productivity is a means, not the end itself. Packing your schedule just so that you can have more to check off and feel important about is setting yourself up for burnout and discouragement. On the other hand, mindfully choosing what your big picture end goals are, then completing tasks that get you closer to those goals should leave you recharged and fulfilled at the end of the day. As far as the bit about education, I appreciated her honesty about how hard her year of homeschooling her daughter was for them all. I am fine with having my kids in public school; I am open to homeschooling if a need presents itself, or if we feel that would be best at some point. Right now, though, the kids are adjusting and happy--for the most part--so we're sticking with that. I will admit that I haven't sat down and given it serious thought at the beginning of each school year like she does. What are your thoughts on intentional living? Anything to add?